Find the colour value of any colour on your screen. Find the value of a colour: Move the pointer over the pixels whose values you want to see. 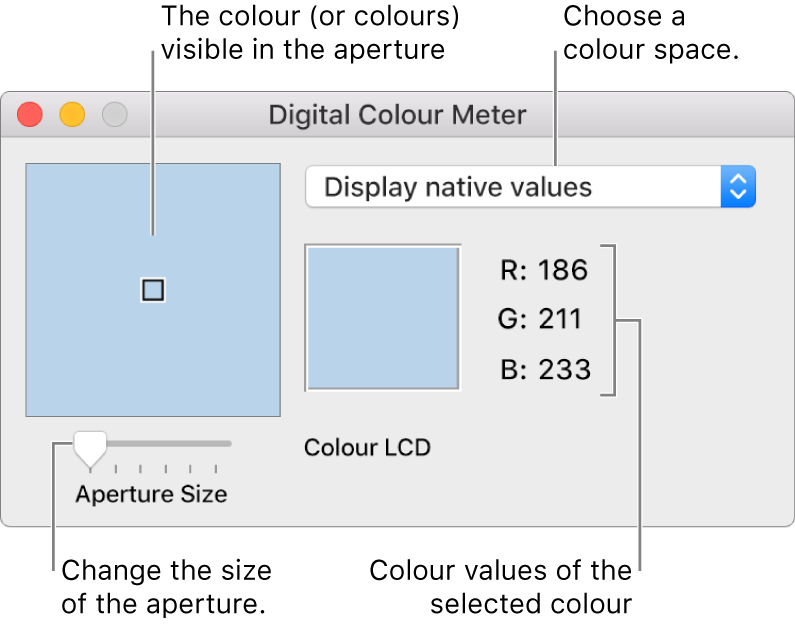 The colour under the pointer is displayed in the Digital Color Meter window, with its colour values on the right. 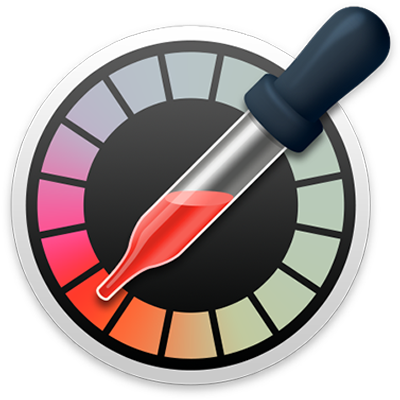 To change the format of the displayed colour values for RGB-based colour spaces, choose View > Display Values. Adjust the size of the aperture: Drag the Aperture Size slider. Make the aperture smaller to select a small area or a single pixel. If more than one pixel is within the aperture, the colour values of all pixels are averaged. Choose a different colour space: Click the pop-up menu, then choose a colour space. The values shown are specific to the colour space you choose. Lock the aperture horizontally: Press Command-X. Lock the aperture vertically: Press Command-Y. Lock the aperture in both directions: Press Command-L.
Locking the aperture makes it easier to copy the pixel’s colour value. When the aperture is locked both horizontally and vertically, it doesn’t move as you move the pointer. Copy the colour value as text: Choose Color > Copy Color as Text, or press Shift-Command-C. Copy the colour value as an image: Choose Color > Copy Color as Image, or press Option-Command-C.